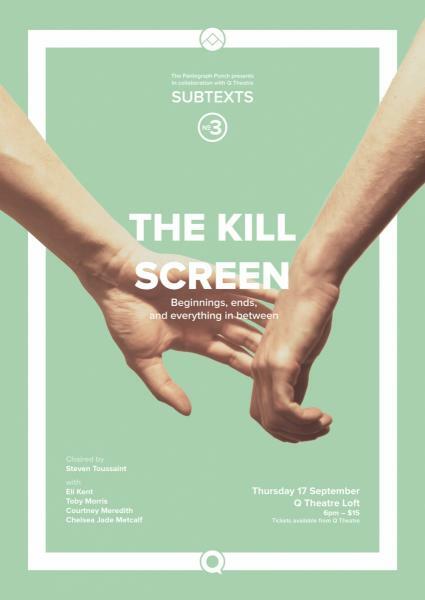 SUBTEXTS // The Kill Screen: September 17, 6pm, Q Theatre Loft, $15. The last night is… The Kill Screen. When you’re creating something – whether it’s a painting, a play, or a song – how do you know when you’re done? When is a work ready to meet the world, and when is it time to slay the muse? Join our panel of artists, musicians and writers – Eli Kent, Chelsea Jade Metcalf, Courtney Sina Meredith and Toby Morris – in conversation with Steven Toussaint about beginnings, ends, and when to put the pen down.